Roasted Spiral Butternut Squash “Noodles” with Garlic, Rosemary, and Browned Butter. 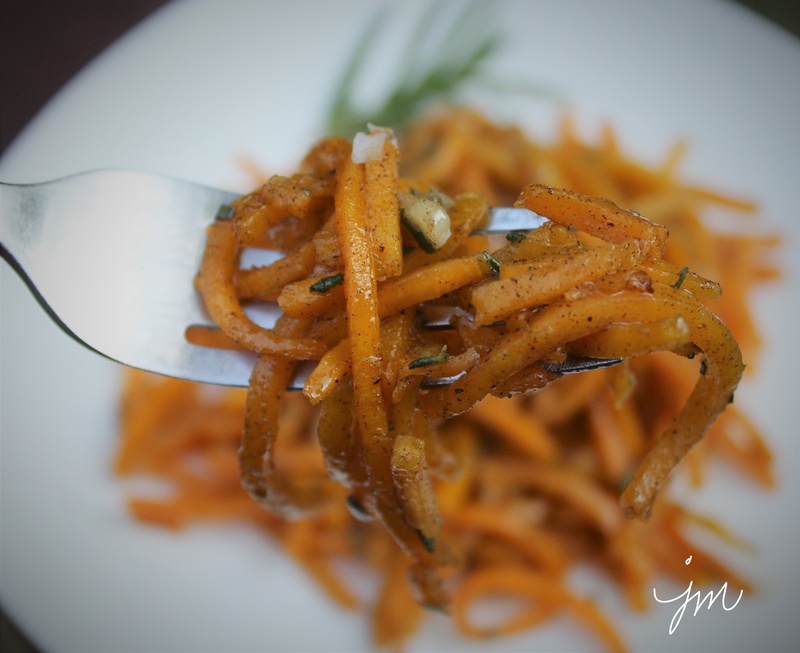 Where have you been all my life spiralized butternut squash? 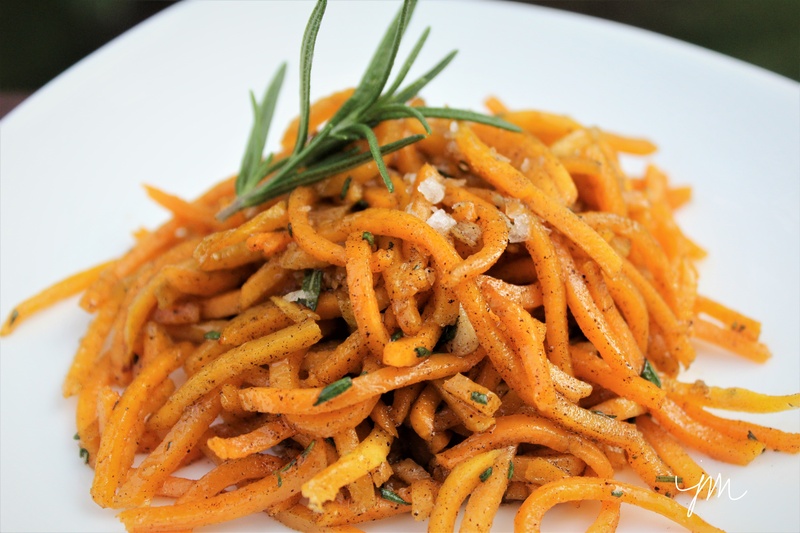 Many of us have been spiralizing our zucchini squash into beautiful noodles, but am I one of the last on the bandwagon for spiralized butternut squash??!! I happened to come across a package of fresh spiral-cut butternut squash at my local Aldi Grocery Store recently. I thought about pan frying it in butter and garlic, but then chose to roast it like I typically do with cut butternut squash, and WOWZIE PaZOWzie was I pleased! What a quick, easy, delicious, and nutritous treat! Here is the super simple, yet amazingly delicious way I prepared it. Preheat oven to 400 degrees F. Brown butter in skillet. Watch closely so it doesn’t burn. Once browned, remove from heat and stir in garlic. 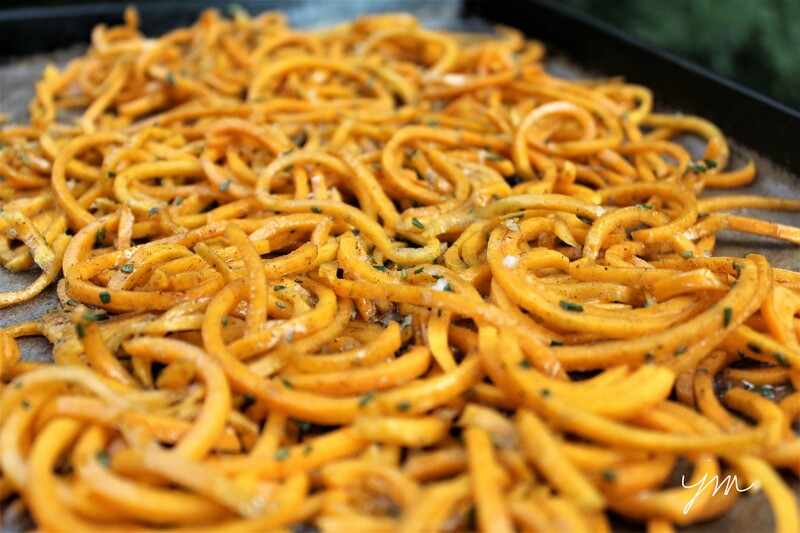 Spread spiral-cut butternut squash “noodles” onto a stoneware bar pan or your favorite shallow baking pan. Sprinkle with salt. Drizzle with garlic-enhanced browned butter. Top with minced rosemary. Toss to coat all. ← What Would You Be? i’ve never tried these either and have been curious about them. your recipe sounds like a great way to prepare them and i’m going to try it! Wow, it’s a good thing I”m growing butternut squash this year! A fall must! Looks great. I generally am not a squash eater but I think I would enjoy yours! This looks and sounds delicious! YUM!! Oh, this dish look scrumptious. I can get these BS Noodles at my Trader Joe’s. This is a keeper in the Jodi recipe file. So easy and SOOOOO YUMMY!! Is there a Trader Joe’s nearby?? It looks good! Love that top image! I’m glad that your recipe lists “prepared” spiralized squash. Otherwise, I might have felt that I was guilty of cheating. Of course, there is the minor substitution of garlic powder for the detested garlic cloves. Browned Butter elevates this recipe to positively yumalicious! Thank-you! You know it – the browned butter is the bomb!! Can’t wait to try this, Jodi! Hoping Trader Joe’s carries spiralized butternut squash. Aldi is not in these parts–sounds like an interesting store. I’m pretty sure they do too!! This sounds insanely good Jodi! Yummmm these look so good! !